I'm a sucker for buying the big bags of lemons at the grocery store. It's silly because I almost never use up all of them unless I'm making lemonade, which means I'll almost have to throw away a few. It's sad when I have to. I know I can do other things with it and one of those things is to make a lemony vinaigrette. It's the easiest way for me to use up anything citrus: to make a vinaigrette. Lol. 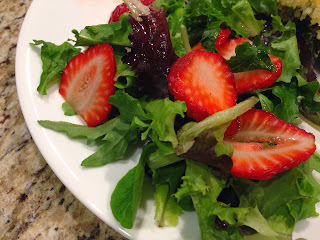 This vinaigrette can be used on any salad with strawberries and/or sweet greens. If not using on a salad with sweet ingredients, I'd add more honey. In a bowl, combine lemon juice, honey, salt and pepper. Drizzle in 2/3 of the olive oil while whisking vigorously. Taste and add more olive oil if the vinaigrette is too acidic. In a large salad bowl or mixing bowl, combine mixed greens, strawberries and pistachios. Drizzle dressing over greens and gently toss. Serve with a creamy/rich entree.